Director – Mark Pellington, Screenplay – Richard Hatem, Based on the Book by John A. Keel, Producers – Gary Goldstein, Gary Lucchesi & Tom Rosenberg, Photography – Fred Murphy, Music – tomandandy, Music Supervisor – Liza Richardson, Visual Effects Supervisor – Richard Grasmere, Visual Effects/Animation – Cinesite, Miniatures – Fantasy II Film Effects (Supervisor – Gene Warren Jr), Special Effects Supervisor – Peter Chesney, Production Design – Richard Hoover. Production Company – Lakeshore Entertainment. Washington Post reporter John Klein is driving to an interview when he finds that he has without explanation ended up several hundred miles away in the small town of Point Pleasant, West Virginia. When his car stalls, he goes to ask help at the nearest house only to have the owner, Gordon Smallwood, pull a shotgun and insist that he has been knocking at the door each of the last two nights at 2:35 am. From the local sheriff, Connie Parker, Klein learns that the town has been plagued by bizarre incidents – people with inflamed and bleeding eyes and ears, mysterious phone calls, visions of people who aren’t there and especially of a dark angel figure from East European mythology known as The Mothman. Smallwood then begins to receive visions from The Mothman giving enigmatic clues to disasters before they happen. Next, The Mothman telephones Klein, promising that he will soon see his late wife. The Mothman Prophecies purports to be based on a true story – it is adapted from paranormal investigator John A. Keel’s 1975 non-fiction book that documents events that plagued the town of Point Pleasant, West Virginia for a year. However, the film’s claim to be based on truth is something that should be regarded with a great deal of dubiousness. For one, the events the film are supposedly based on occurred between 1966 and 1967 but the film is clearly taking place contemporary – cellphones are present, the computers are using Windows operating systems, the cars are modern and there is reference to the 2004 Presidential race. It was evidently too much trouble for the film to shoot period but this tends to blatantly distract from any claim to its telling a ‘true story’. You cannot help thinking if the film is so loose with the facts as to locate the events thirty years after they actually happened, then how authentic can it be on other essential matters. If a film wants to play loose with the facts of the case for dramatic purposes then it seems bogus of it to be announcing on the opening credits that this is a true story rather than one that is only loosely based on a true story. The Mothman Prophecies is best appreciated wholly as a work of fiction rather than as a true story. In such light, it eventually proves rather absorbing. Director Mark Pellington employs the dark subterranean visual look of films like Se7en (1995) and tv series such as The X Files (1993-2002, 2016-8) and Millennium (1996-9). Aided by tomandandy’s dense, constrictive ‘soundscape’, the film broods with looming ominousness where everything from glances into the mirror to aerial shots cruising across the town becomes imbued with sinister, otherworldly menace. The film is akin to Nicolas Roeg’s Don’t Look Now (1973), another intriguing film about precognition, where, like Roeg, Mark Pellington almost makes the film a puzzle of teasing visual clues, creating editing cuts between blurred red and black light sources, fractured reflections and juxtaposed images, where shadows and random images of x-rays, doorway arches and the like seem to be unconsciously forming into moth figures. 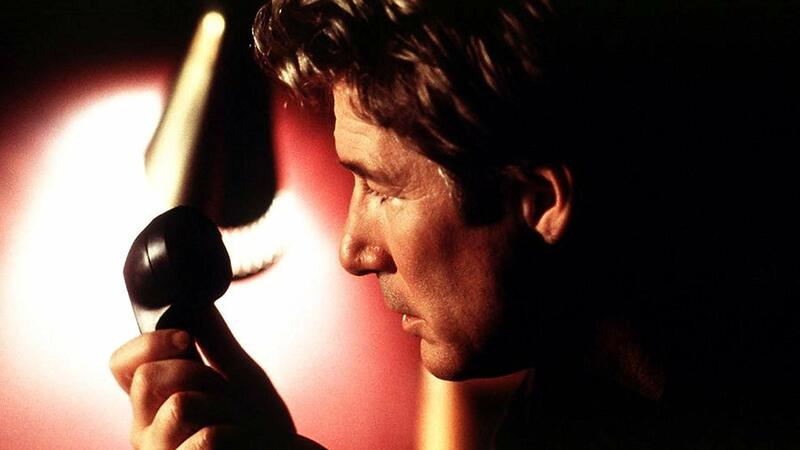 Eventually the film develops a genuinely creepy atmosphere with its reality disjunctions and some disconcertingly spooky scenes where Richard Gere starts receiving phone calls from The Mothman telling him everything he is doing and even before he does it, and the eerie reappearances of his dead wife. An unrecognisable Alan Bates is on hand to offer some disturbing and interesting explanations for what is happening. The Mothman Prophecies leaves one with a sense of something genuinely unearthly and inexplicable occurring, the explanation of which lies clearly beyond the veil of normalcy. Most welcomely, this is well above the usual run of dreary pop-up effects and fake dream sequence jumps that turn up in horror films – this is a film that attains an uncanny and unsettling grip. 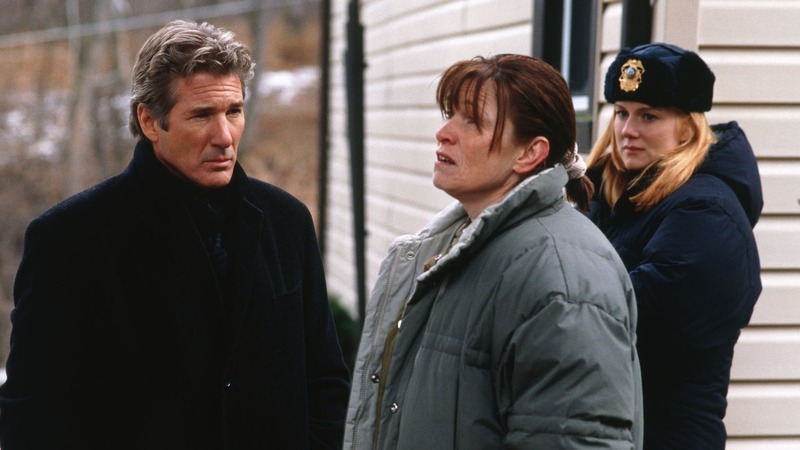 The only part that does not work was the casting of Richard Gere who is far too much of a handsome romantic lead to ever seem particularly troubled by what is happening, let alone someone who has let his obsessions take over his life. Mark Pellington is a former music video director who had previously made the thriller Arlington Road (1999). He has made several other films, the most high-profile being the music documentary U2 3D (2007). The nearest to any other genre work Pellington has made was Henry Poole is Here (2008) about a man whose neighbours think the face of Jesus has appeared on the wall of his home. Pellington has also executive produced The Man from Earth (2007) about the life of an immortal man. (Winner in this site’s Top 10 Films of 2002 list. Winner for Most Underrated Film, Nominee for Best Director (Mark Pellington), Best Adapted Screenplay and Best Cinematography at this site’s Best of 2002 Awards).